Don't know why but this pic makes me wanna cry... I miss them too! 'cause they look so young! Ohh the original band! Those were the high times! 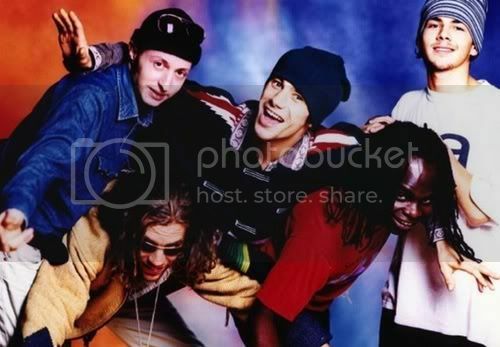 Jamiroquai is not only about the music, it's their background, their history, the fact that they started from no where. JamiroNuts wrote: Ohh the original band! Those were the high times! that's why I admire them so much...the fact that they started from no where and look what they've reached now. But for each group of people who dropped school to become musicians there are a gazilion who dropped school with the same purpose and ended up cleaning the streets or even worse, dead. Jay was lucky to be successful, his career in music could have been a flop. The thing is, he succeeded because he was different, Jamiroquai's style was different from everything that had been before. Plus, there were the hats and the dance moves. Jay himself has said in an interview that it was mere luck that they were chosen for a deal by Sony. There were countless bands that could have been chosen, but Sony went for them. Sure some could've been luck. But I think it was more. it floored me! I was amazed with their sound. Music needed them. I loved 80's Soul, and I was tired of the Alternative scene of the early 90's. And the faceless image of someone dancing in hats was like an extension of the Rave scene. i think it's all about being talented, work hard and of course having luck. some of the people who dropped school for music are very talented they just didn't have luck in the right time. jamiroquai had all that, plus, they've got attitude, personality, a particular sonority AND "hats and dance moves"
R I T A wrote: that's why I admire them so much...the fact that they started from no where and look what they've reached now. Yes but the actual band line-up is just enjoying the success the original band line-up make! So you can't say they started from no where and they're now enjoying their work, because that's wrong! The name Jamiroquai is now a success thanks to Toby Smith, Stuart Zender, Simon Katz, Wallis Buchanan, and I don't see them enjoying the success of their work! They are all very lucky (the actual band) that they had those magical musicians in the past and now they can still live in the music thanks to the wonderful job those guys did on the 90's..! The name Jamiroquai is popular thanks to them! Yes, the early members were something. But I'm glad there are new members to continue on with Jamiroquai. Cuz they're great too. But I would love to see the success for the early members in other avenues. Yes, of course Jay Kay has been the greatest mind in all this thing! but, as far as I remember, Jamiroquai became a successful hit when Traveling Without Moving came out! So, the credit goes to the people who worked hard for that album! The actual line-up is cool but, there's no way to compare them to the legend the 97' band are right now! The 2010 line-up has some work to do if they want to have the success the 97' band had those glory days! Yes Funk Education I agree. I only knew Jamiroquai from TWM. After, I heard they broke up. That crew from TWM was the group that made Jamiroquai famous. They had something together. Jump to today, and given the choice of no band or a new one, I'll choose to keep Jamiroquai alive. And I think I like Dynamite better than TWM. Oh -have to edit above. I can't say which I like better. Because I do love TWM, but I've had that one for 14 years. So all the other music is still sorta new! Last edited by Giba7 on Sat Sep 18, 2010 8:42 pm, edited 1 time in total. Giba7 wrote: And I think I like Dynamite better than TWM. but that's nice! its open for us to like whatever we want! I also choose to keep Jamiroquai alive, but I also choose they play some good music! forget the "commercial" thing and do some good stuff! If you canÂ´t see the pic use the direct link! funny shot from the seven days in sunny june videoshoot!